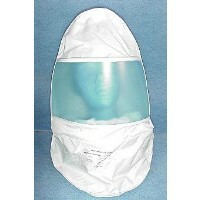 Avoid the harmful impact of chemical vapors and damaging particulates with the correct protective hood or facemasks. If you are using a PRO-AIR Respirator system you need to use only those masks and hoods that are NIOSH Approved. The Half Facemask is a comfortable Neoprene Mask with durable strap assembly provides maximum seal with a wide sealing edge that fits securely against the face. You'll find it's a pleasure to wear. 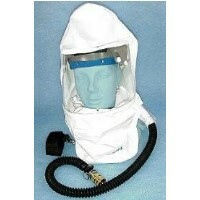 The Pull Over Hood is to be Worn Over the Half facemask Providing Protection from Contaminated Air for the Whole Head. With A Large 16" x 6 1/4" viewing area This Hood Provides Excellent Visibility and the Constantly Moving Air Eliminates Fogging of the Lens. 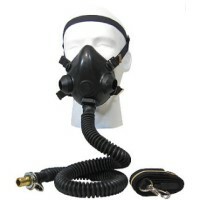 The Air Supplied full facemask offers excellent protection when isocyanates or other eye-irritant materials are present. A great choice when your application dictates crawling into tight areas or a lot of head turning and reaching. 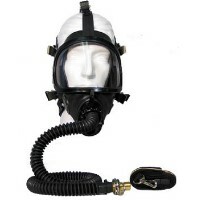 The seven point head harness holds mask comfortably to your head and face. The Air Supplied Tyvek Painting Hood is durable and provides full protection. Large 16" x 6 1/4" viewing area and ratcheting headband for a secure fit are included. When used with any Hobbyair System it will supply cool fresh air to the hood, which circulates and exits around neck. Air flow prevents lense fogging.